& humans make mistakes. It's always miffed me that the league doesn't say more publicly about officiating. That having been said they are, after all, a major part of any game. Without them games don't happen. 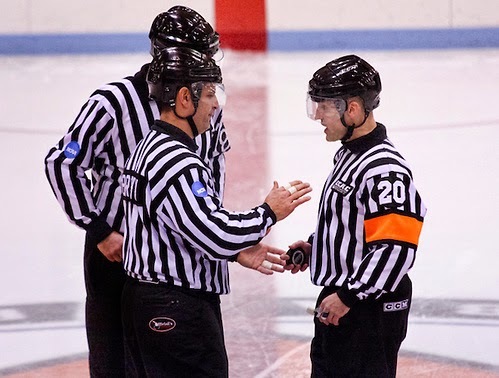 Without great officials the game isn't as great as it is today. I think that they are under appreciated. We don't hear about 95% of the things they do, because they do it right most of the time. That's professionalism at it's best in my eyes. The league, however, should celebrate the good & point out the bad when it happens. In a silent way, I guess it happens once we get to the playoffs. The officials who are working are being rewarded for being the best. So when your talking .25 or .50 of a second… I say good on them for getting it right most of the time. Kevin J. Alexander The pendulum has to swing both ways. Usually officials will try to even things up when they realize after the fact that they've made a bad or questionable call. But I don't see that happening lately. Last night's game was a perfect example - the Rangers committed their share of crimes against the Pens... but only one of them was called. / I thought Bortuzzos shoulder to shoulder hit on Jagr was legal and thought Jagr should have been thrown out of the game for trying to slewfoot Bortuzzo and spearing him with his stick right in front of the official about three minutes earlier. It was dirty, dangerous and wasn't committed in the course of playing the game like Bortuzzos hit was. The same favoritism for Jagr works in reverse against Steve Downie - he gets called for just about anything and everything... but if a player on the opposing team trips him or takes a whack at him they don't get penalized. The personal biases need to be eliminated - if it's a penalty it's a penalty. Period. Bryan Madden There needs to be some level of transparency from the NHL on this subject. It appears as though the standard for penalties has become somewhat dynamic. I doubt this is the intent of the rules. Officials are human and therefore subject to making mistakes as any other human. What needs to happen is when a mistake occurs, acknowledge it, take ownership of it and live with the consequences. Since everything relating to Officials is done in secret, it does not appear that there is any accountability. This undermines the integrity of the game. Now I understand that this is a very fast game and the on ice Officials have a very very difficult job. The smaller in tenths of a second that these standards are pushed the more mistakes human Officials are going to make. That is inevitable. So either ease the standard or show some transparency. Personally I would like to see both. Thanks to everyone who took the time to reply to my post. We always welcome your feedback.